The Tibetan Plateau, also known in China as the Qinghai-Tibet Plateau, has a large influence on atmospheric circulation, hydrological cycle and climate in East Asia as well as the Northern Hemisphere. The plateau, sometimes called "the Roof of the World" or "the Third Pole", covers a huge area located in 73-105 E longitude and 26-40 N latitude, with mean surface elevation of 4000-5000 m above sea level. It has long been considered as one of the remote regions in the Eurasian continent that are relatively less influenced by pollution from human activities. While natural processes that control the temporal and spatial variations of atmospheric composition over the Tibetan Plateau are still inadequately understood, the influence of long-range transport of pollutants from surrounding areas, e.g. South and Southeast Asia, and farther regions on the background atmosphere of the Tibetan Plateau and associated climate impacts have become a scientific issue to be intensively addressed. Long-term measurements of trace gases, aerosols and radiation have been performed at several remote sites in the Tibetan Plateau region, including e.g. the Waliguan Global Baseline Station and the Shangri-la Regional Background Station (both operated by China Meteorological Administration) and the Nam-Co Comprehensive Observation and Research Station (operated by Institute of Tibetan Plateau Research, Chinese Academy of Sciences). Intensive field campaigns were carried out based on these stations and some other sites of the region during different periods to investigate the levels and variation controlling factors of atmospheric ozone and aerosols over the plateau. Observations include in-situ measurements of ozone and related trace species, in-situ and sampling measurements of aerosol physical properties and chemical composition, sounding of ozone and water vapor, lidar measurements of aerosols, and ground-based remote sensing of selected trace gases, etc. Models are also used to compare with measurement results and interpret data. The purpose of this issue is to expand our understanding of physic-chemical and transport processes that largely influence atmospheric ozone and aerosols as well as radiation over the Tibetan Plateau. The highly time-resolved chemistry and sources of PM1 were measured with an Aerodyne HR-ToF-AMS at Waliguan Baseline Observatory, a high-altitude background station located at the northeastern edge of Qinghai-Tibet Plateau (QTP), during summer 2017. Relatively higher mass concentration of PM1 and dominant sulfate contribution were observed in this northeastern site of QTP compared with those at other high-elevation sites in the southern or central QTP, indicating their different aerosol sources. Detailed molecular chemical composition of water-soluble organic matter in the Himalayas was characterized by positive electrospray ionization Fourier transform ion cyclotron resonance mass spectrometry for the first time. Many products formed from biogenic volatile organic compounds and biomass-burning-emitted compounds were found in the organic compounds, suggesting the important contribution of these two sources in the Himalayas. To understand the impact of transboundary atmospheric black carbon on the Mt. Everest region and depict the transport pathways in different spatiotemporal scales, we first investigated the concentration level, temporal variation, and sources of black carbon based on high-resolution (2-year) measurements at Qomolangma (Mt. Everest) Station (4276 m a.s.l.). Next, the WRF-Chem simulations were used to reveal the transport mechanisms of black carbon from southern Asia to the Mt. Everest region. Snow albedo plays a key role in the Earth and climate system. It can be affected by impurities and snow properties. This study implements new parameterizations into a widely used snow model to account for effects of snow shape and black carbon–snow mixing state on snow albedo reduction in the Tibetan Plateau. This study points toward an imperative need for extensive measurements and improved model characterization of snow grain shape and aerosol–snow mixing state in Tibet and elsewhere. Deposition of light-absorbing carbonaceous aerosol on the surface of glaciers can greatly alter the energy fluxes of glaciers. Two years of continuous observations of carbonaceous aerosols in a glacierized region are analyzed. We mainly studied the light absorption properties of carbonaceous aerosol and have employed a global aerosol–climate model to estimate source attributions of atmospheric black carbon. 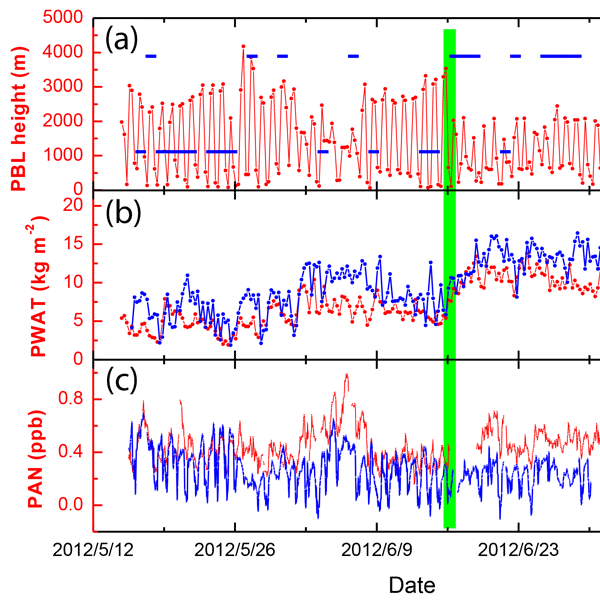 We present the first simultaneous PAN and O3 measurements from the central Tibetan Plateau. Both gases showed unique diurnal cycles with steep rises in the early morning and broader daytime platforms, which is attributed to the PBL evolution. Some high PAN and O3 episodes were observed and caused either by long-range transport of pollutants from south Asia or by downward transport of air masses from the upper troposphere, indicating the dynamic impacts on tropospheric chemistry over the Tibet. The impact of anthropogenic emissions and climate variability on the long-term trends and periodicity of surface ozone measured at Mt Waliguan (WLG) for the period of 1994–2013 is studied. STT ozone and rising emissions in eastern China contribute to spring and autumnal increasing trends, respectively. The 2–3-, 3–7-, and 11-year periodicities in the ozone data are linked to the QBO, EASMI, and sunspot cycle, respectively. An empirical model is obtained for normalised monthly ozone at WLG. 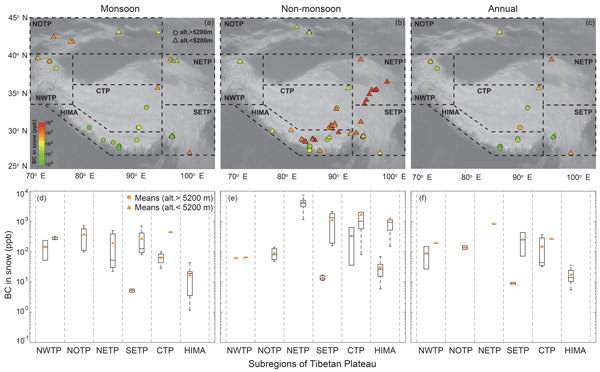 This manuscript presents results from a comprehensive field study using an HR-AMS coupled with a suite of other instruments in central Tibetan Plateau. The study discusses the chemical composition, sources, and processes of submicron aerosol during the transition from pre-monsoon to monsoon. Organic aerosol was overall highly oxidized during the entire study with higher O / C ratios during the pre-monsoon period. 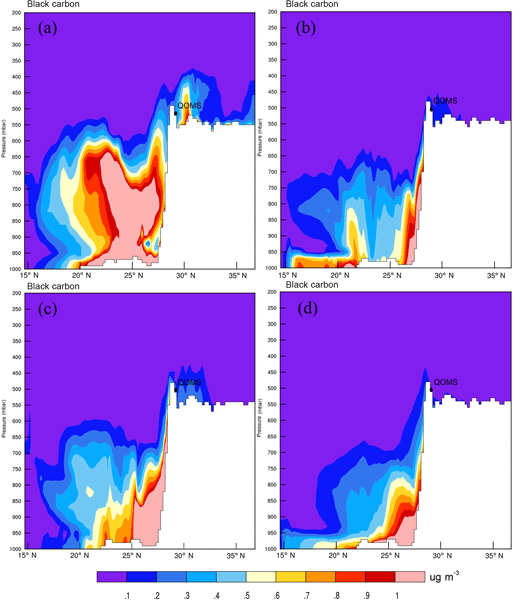 Sensitivity of air pollution transport with synoptic process was also evaluated. 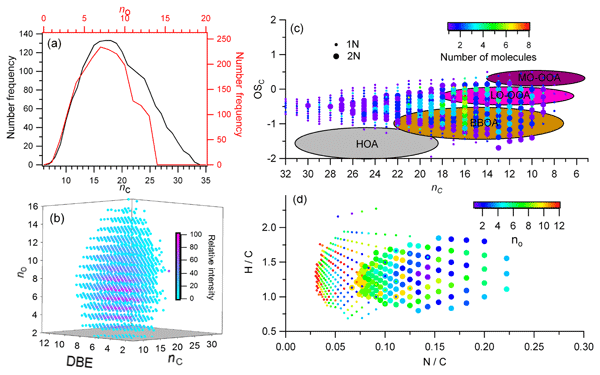 By monitoring aerosol properties as a function of high-resolution chemical composition, this study sheds light on the evolution processes of particles in the Tibetan Plateau background environment during the pre-monsoon season. A positive matrix factorization analysis integrated with a mesoscale meteorological model clearly shows that the southeastern edge of the Tibetan Plateau was affected by air pollutants transported from active biomass burning areas in South Asia. High-resolution ozone and water vapour profiles over Lhasa, China, were measured in August 2013. The correlations between ozone and water vapour profiles show a strong variability in the upper troposphere. These relationships were investigated using CLaMS trajectory calculations. The model results demonstrate that three tropical cyclones (Jebi, Utor, and Trami), occurring over the western Pacific, had a strong impact on the vertical structure of ozone and water vapour profiles. The first observation net of background atmospheric aerosols of the Himalayas and Tibetan Plateau were conducted in 2011–2013, and the aerosol mass loadings were especially illustrated in this paper. Consequently, these terrestrial aerosol masses were strongly ecosystem-dependent, with various seasonality and diurnal cycles at these sites. These findings implicate that regional characteristics and fine-particle emissions need to be treated sensitively when assessing their climatic effects. We evaluate Aura Microwave Limb Sounder retrievals of temperature, water vapour and ozone over the eastern Tibetan Plateau against measurements from balloon-borne instruments. The newest version of the retrievals (v4) represents a slight improvement over the previous version, particularly with respect to data yields and upper tropospheric ozone. We identify several biases that did not appear in evaluations conducted elsewhere, highlighting the unique challenges of remote sensing in this region. This is the first study to examine nitrate aerosol in the upper troposphere and lower stratosphere (UTLS) over the Tibetan Plateau (TP) and the South Asian summer monsoon (SASM) region in summer. Nitrate aerosol is simulated to be the most dominant aerosol species in the UTLS over the studied region. The mechanisms for the accumulation of nitrate in the UTLS over the TP/SASM region include vertical transport and the gas-to-aerosol conversion of nitric acid to form nitrate. Long-term characteristics and trends of baseline surface ozone concentration at Waliguan station in western China for the period of 1994 to 2013 were analysed, using a modified Mann–Kendall test and the Hilbert–Huang transform analysis for the trend and periodicity analysis, respectively. Significant increasing trends were detected in all seasons, except for summer. The non-linearity caused by the interannual variation of ozone concentrations is evident, showing a 2–4-year, 7- and 11-year periodicity. We found that anthropogenic refractory aerosols (e.g., soot, fly ash, and visible organic particles) likely adhere to the surface of SIA particles larger than 200 nm due to coagulation. Biomass burning and coal combustion both constantly contribute to anthropogenic particles in the QTP background atmosphere. Organic coating and soot on surface of the aged particles could have different impacts on their hygroscopic and optical properties in the QTP compared to the urban aerosols in East China. An intensive measurement campaign was conducted at the Qinghai-Tibetan Plateau using a ground-based single particle soot photometer (SP2) and a photoacoustic extinctiometer (PAX). 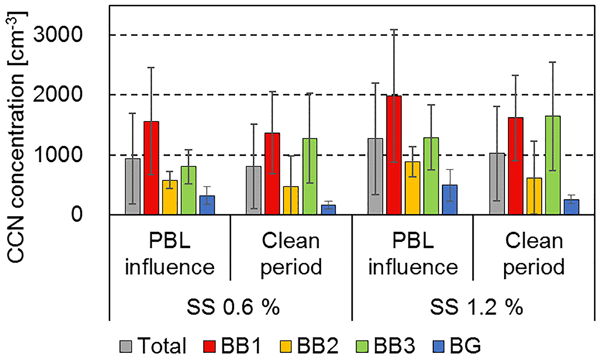 Significant enhancements of BC loadings and number fraction of coated BC were observed during pollution episode. Backward trajectory, fire counts map and potential source contribution function model studies suggest that the biomass burning air masses from North India contributed to the increased BC loadings. Different monthly variation patterns of aerosol optical depth are observed over the southern and northern Tibetan Plateau (TP). A natural boundary seems to extend to an altitude of 6–8 km, acting as a dividing line of higher dust occurrence in the northern TP and lower dust occurrence in the southern TP. The seasonal variations and spatial distribution patterns are closely related to high altitude terrain and atmospheric circulation. An autumn field campaign was conducted at a national background site (3295m a.s.l.) in the Tibetan Plateau. The submicron aerosol was dominated by organics (43%) and sulfate (28%). Secondary organic aerosol (SOA) dominated OA (85%) with 17% being aged biomass burning OA. New particle formation and growth events were frequently observed with an average particle growth rate of 2.0nm hr-1. The important role of organics in particle growth in the Tibetan Plateau was also demonstrated. 1) Seasonal trends of SOA tracers and its origins were studied in the remote TP for the first time. 2) Seasonal variation of isoprene SOA tracers was mainly influenced by emission. 3) Due to the transport from the Indian subcontinent, aromatics SOA tracer presented relatively higher levels in the summer and elevated mass fractions in the winter. 4) Biogenic SOC dominated over anthropogenic SOC in the remote TP. We use the CAM5 model with a novel source tagging technique to characterize the fate of BC particles emitted from various geographical regions and sectors and their transport pathways to the Himalayas and Tibetan Plateau (HTP). We show a comprehensive picture of the seasonal and regional dependence of BC source attributions, and find strong seasonal and spatial variations of BC-in-snow radiative forcing in HTP that can be quantitatively attributed to the various regional and sectoral sources.